Sinan Barazi grew up in Copenhagen, Denmark. He attended Winchester College before starting Medical School in London. He qualified from King’s College Hospital School of Medicine in 1996, and completed his internship/house jobs a year later. Before starting his Basic Surgical Training, he served with the 14th Parachute Regiment (a part of the French Rapid Reaction Force) in Toulouse, France. After completing the Membership of the Royal College of Surgeons in 2002, he started his Higher Surgical Training in Neurosurgery in London, working at King’s College Hospital, Atkinson Morley’s Hospital, St. George’s Hospital, and Hurstwood Park Neurological Centre. He completed the FRCS (Neurosurgery) in 2009. At the end of his training he completed a fellowship in endoscopic pituitary surgery in Bologna under the supervision of Dr Giorgio Frank. Following completion of the FRCS, he trained under Andrew King and Scott Rutherford in Manchester as Neurosurgical Skull Base Fellow. 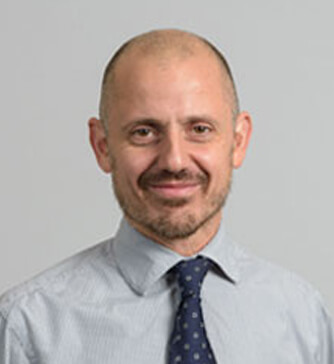 He was then appointed as Consultant Neurosurgeon to King’s College Hospital in 2010, with sub-specialty interests in facial pain, endoscopic pituitary/anterior skull base surgery, and lateral skull base surgery.